My friend Jon Del Arroz has a new novella out this week. The Gravity of the Game fits into a rather unusual niche: science fiction sports stories. Attention all, we’ve found a unicorn! I know – two great tastes that go great together. Like ice cream and kale, strawberries and Pine Sol, or ribeye and motor oil. I strongly suspect that the sports guys and the scifi guys will interpret those metaphors very differently. But they’ll both agree that unlike each of those combinations, Jon’s novella is actually really good. 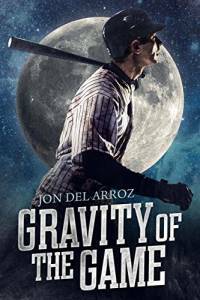 Whether you’re a sports guy or a scifi guy, you’ll enjoy this story. In a future of near-Earth space travel, the World Baseball League is coping with a sharp decline in attendance and viewership. Commissioner Hideki Ichiro thinks he knows the answer: baseball on the moon! First of all, that’s actually kind of a cool idea. I’m not a sports guy, and I’m definitely not a baseball guy. To me, it’s one of the slowest and dullest sports out there – long periods of boredom punctuated by a few moments when something almost interesting happens. But come on – you put “on the moon” after anything and it becomes cool. But that’s not what makes the story work. That just makes an interesting hook. The story works because of Commissioner Ichiro. This is a man who loves baseball so much that he almost makes me love the sport. And though I don’t share his love of baseball, I definitely identify with and respect his passion. Somewhat like baseball itself, this is a dramatic piece with no actual “action” in it. But the drama and the characters will keep you interested. I give The Gravity of the Game five stars out of five, and dare you not to find Commissioner Ichiro just as captivating as I did.